A rich dark chocolate cupcake is slathered with mint flavored butter cream frosting and sprinkled with semi-sweet chocolate chips. The cupcake is surrounded by a blue and white striped border and a tiny blue and whited checked bow is glued at the top. It's a good thing I don't have any of these sitting around the kitchen or they'd all be gone! It's a good thing your artwork is calorie free. I love cupcakes though. Can't get enough. Mint + chocolate, two of my favs together! Cute painting! 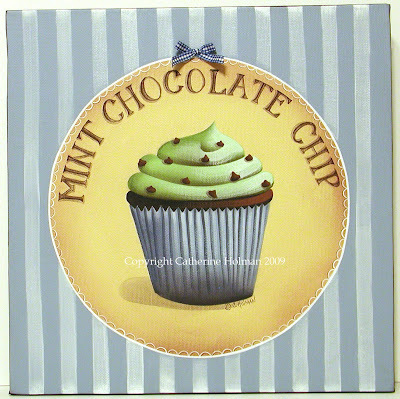 Hi Catherine...ow my goodness, chocolate chip mint is my favorite ice cream you know...and I'm positive I would love it on a cupcake as well!!! Right up the alley for my taste buds. 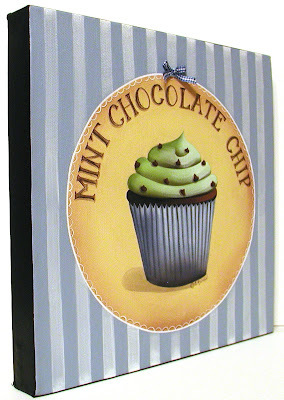 Your cupcake paintings are too cute! Although they are making us very hungry at the moment!